In this lesson, we will learn how to solve problems by identifying linear patterns in concepts. A school organised a trip where there is a fixed cost of 3 1 7 p o u n d s and the rest of the cost is dependent on the number of students attending. The total cost for a trip with 3 5 p o u n d s students is 5 9 7 p o u n d s . Find the total cost of the trip for 60 students given the relationship between the total cost and the number of students is linear. The graph shows the relationship between distance and time in a 160-metre race between a hare and a tortoise. 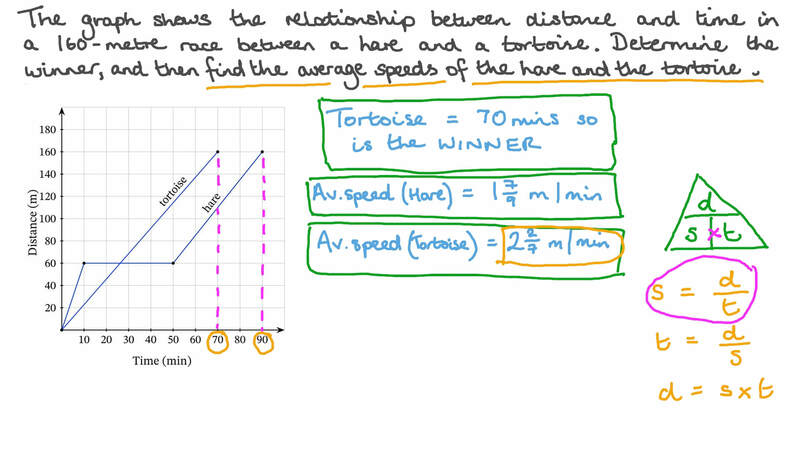 Determine the winner, and then find the average speeds of the hare and the tortoise. A boy was reading a book and found out that after reading for 2 hours he still had 344 pages left and after reading for 3 hours he had 43 pages left to read. Find the linear equation between the time 𝑡 and the number of pages left to read 𝑏 .
Samar and Adel are professional cyclists training for an upcoming race. The given graph represents the distance Samar traveled during one training session. The distance traveled by Adel is given by the function , where represents the distance in miles and represents the time in hours. Which of them is travelling faster? Which of the following functions increases at a higher rate? The given figure shows the relation between the covered distance 𝑑 in kilometres and the elapsed time 𝑡 in hours for two trains, A and B, between two railway stations. Find the average speed of each train. Which of the following is the same as the function 𝑔 ( 𝑥 ) = 2 𝑥 − 3 ? EThis is not a function. Adam’s favourite drink is hot chocolate; he drinks it whenever it rains. As shown in the table, the number of cups of hot chocolate he drinks in a week is twice the number of rainy days that week. Which of the following statements is true? AThe dependent variable is the number of cups of hot chocolate that he drinks, and the independent variable is the number of rainy days. BThe dependent variable is the number of rainy days, and the independent variable is the number cups of hot chocolate that he drinks. CThe independent variables are the number of cups of hot chocolate he drinks and the number of rainy days. DThe dependent variables are the number of cups of hot chocolate he drinks and the number of rainy days. If 𝑓 ( 𝑥 ) is a linear function, find an equation for it given 𝑓 ( 4 ) = − 1 and 𝑓 ( 9 ) = 2 . Find the correct rule for the numbers in the table. A Multiply 𝑥 by 4 to find 𝑦 . B Double 𝑦 to find 𝑥 . C Add 2 to 𝑥 to find 𝑦 . D Subtract 2 from 𝑥 to find 𝑦 .
E Divide 𝑥 by 4 to find 𝑦 .
Karim is going to do a sponsored bike ride to raise money for charity. His uncle has promised to donate $12 more than the total amount that Karim raises. The graph and table show the relationship between the amount of money his uncle will donate ( 𝑑 ) and the amount of money that he raises ( 𝑚 ) . Which of the following statements is true? AThe dependent variable is the amount of money that his uncle donates. BThe dependent variables are the amount of money that his uncle donates and the amount of money that Karim raises. CThe dependent variable is the amount of money that Karim raises. DThe independent variables are the amount of money that his uncle donates and the amount of money that Karim raises. EThe independent variable is the amount of money that his uncle donates. A school organised a trip where there is a fixed cost of 7 8 p o u n d s and the rest of the cost is dependent on the number of students attending. 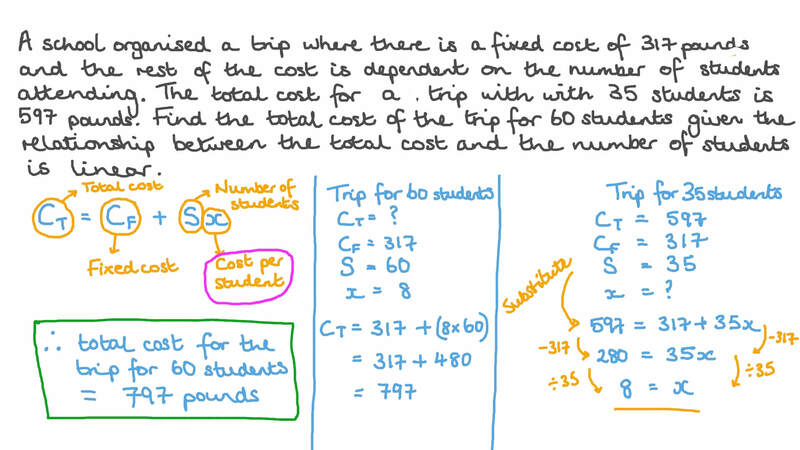 The total cost for a trip with 1 0 p o u n d s students is 4 2 8 p o u n d s . Find the total cost of the trip for 25 students given the relationship between the total cost and the number of students is linear. A boy was reading a book and found out that after reading for 7 hours he still had 256 pages left and after reading for 8 hours he had 57 pages left to read. Find the linear equation between the time 𝑡 and the number of pages left to read 𝑏 .